‘Distant hills’ is perhaps one of Cotton’s most inconclusive and abstract photographs, for it prevents us from gaining a definitive understanding of precisely what we are looking at. This is achieved through Cotton’s playing with scale, namely by the use of a flower that is much larger than the landscape with which it is montaged (which includes trees and the ‘distant hills’). 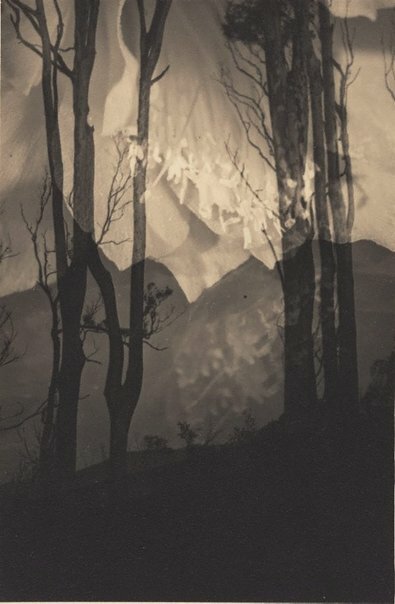 A rare and little-seen work, it is a fine example of Olive Cotton’s skill as a printer as well as being suggestive of her conceptual concerns as a photographer. Signed l.r., pencil "Olive Cotton". Not dated.